Every time a person loads money onto CitizenCard Love2shop card they get 7% off. That means that if you load £10 you get £10.70 to spend and if you load £100 you get £107 to spend - perfect for when you want to make a big or small purchase. The only extra cost is a one off £1.50 fee the first time you load money onto your card. The card balance can be checked on the move using a Love2Shop app available on Google Play Store® and Apple App Store®. 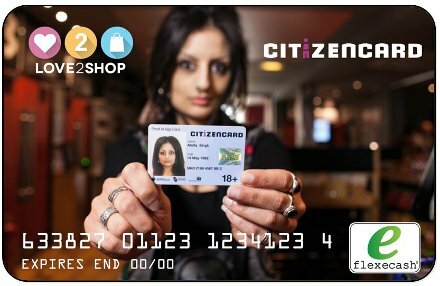 Existing holders of a CitizenCard can get a Love2shop Partner Card with their new 18+ CitizenCard for just £8 (normal cost £12) using LOVE2SHOP discount code at https://apply.citizencard.com/apply/upg. First time over 18 applicants can apply at www.citizencard.com and pay £11 (normal cost £15) using code LOVE2SHOP.